"Tamie Platts and her Team were absolutely "awesome". I moved from out of town, everything was so chaotic, and stress levels were at an all-time high but Tamie Platts and her Team took very good care of me. She assured me everything would be okay and that I was in good hands, which I was indeed! I'm so grateful for the experience that I had with her and I'm humbly appreciative for all she has done for me and my family. Tamie is simply the "Best"!" "Tamie and her team are amazing!! They are quick, responsive, organized and a pleasure to work with. I had the best buying experience and will definitely use them again in the future! If you want the best, use Tamie and her team!!" "Tamie and her team are one group of people that many should get to know. If there is a way to get it done with no shortcuts and done right they'll do it. It took some time but they will stay from beginning to end and give you a course of action you should take inorder to purchase a home"
"Did their job and made the process as smooth and understandable as possible. I was grateful to the entire team for being so professional, I am big on being respectful and professional especially with something as big and serious as buying your first house. Only thing they missed was a closing gift for clients buying a house that is key no matter how little the gift is just to show appreciation, buying a house is a big purchase and I know most Lenders give gifts at closing to congratulate their clients." "Tamie was very easy to work with and kept us informed and up to date - would definitely recommend for anyone looking to move to the Peachtree City area." "We could not have asked for better service! Our loan had to close quickly because of multiple buyers and travel and work schedules. They worked and worked and kept us notified all through the due diligence process. We closed ON TIME thanks to Tamie and her team. and PS: we came to Tamie for this loan because she and her team had done the same thing for a prior home loan! She gets it done!" "Extremely Patient and Thorough! She was very knowledgeable about the process and made it easy to complete the process. I will definitely use her again!" "Our financial planner recommended Tamie for our re-fi. She's the 3rd broker we'd used since buying our house in 2004, and the only one I would use again. She and her team kept us on track and on time with signing electronic documents online, and arranged for the closing to happen at our house based on our schedule. Tamie explained our options very clearly and got us a great rate." "Tamie and her team were patient and hard working to get what we needed in order to close on time! They explained everything we didn't understand and made us feel like they were on our side." "Tamie and her team are absolutely Awesome! They were kind and understanding and very knowledgeable. Working with them was very easy. Everyone was very organized, timely and efficient. My situation was not the easiest yet they were always resourceful and understanding with me. 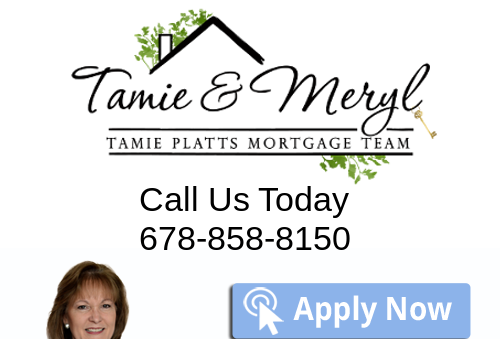 If you are looking for a mortgage or a refinance you should only call The Tamie Platts Team." "Tamie and her team were absolutely wonderful. From the very beginning, she and the entire team educated us as first-time home buyers, supported us, took time to ensure we understood every part of the process and always made us feel that we were valued customers, truly partners. Even things like making sure we had the best homeowners insurance coverage, which honestly, they didn't even have to point out to us and was out of their purview, but they let us know the quote we were initially given was too high and then provided us with a list of trusted providers and helped us get a much better rate! Every step of the way they were ahead of the curve and made sure they had everything they needed so no re-work was required. Tamie was extremely professional, knowledgable and provided weekly updates and emails that contained tips and educational material to help us along the way that I found personally invaluable. I cannot say enough glowing things about this group. We were treated as partners and not just like a number. Not just like a customer. The caring and dedicated customer service from Tamie and the team was world class. I will absolutely return to their care if we ever buy another home in the future as well as send any of our family and friends their way. We are so incredibly grateful to Tamie and her team for all the support and for making our dream come true and ushering us in to a beautiful home for our family!! Thank you Tamie and team!! Special additional thanks to those on the team that helped us as well: Kelsie, Maria and Renee. Kelsie you were integral to our success and understanding throughout the whole process and were always quick to resolve any of our needs. Thank you so much. Maria and Renee - you got us through all the twists and turns of closing and we just wanted to thank you so very much as well!! "Tamie and her team were really great. I met was referred to her in early Feb 17' and we closed in late Mar 17'. Everything she explained that would happened, they all came true. We are truly satisfied." "She was extremely helpful in finding out how we wanted to structure our new purchase. She took the time to get to know us on a personal level, which is very refreshing now a days. She made our transition VERY smooth, and stress less. My son who also used her to finance his new home, recommended her to us. We would definitely recommend her (which we have already done) to anyone!" "Tamie and her team were wonderful to deal with for the refinance of my home. Buying a home or refinancing can be so stressful and nerve racking but I have to say the made it easy and effortless. Thank you so much Tamie!!!" "Tamie is very knowledgeable. She is always available to answer any questions . Tamie is aware of timelines and will remind you of up coming deadlines which was very helpful. I have already recommended her to a friend and will definitely go to her if I need another loan. She is genuine, enthusiastic and honest. I am pleased with her services 100%." "Tamie is the kind of lender you hope for. She is always available and has an answer. She definitely knows her job and how to get you the best rate possible. She is willing to work with you no matter what your scenario and always finds a way. Tamie helped us purchase a home when others said it could not be done, or the interest rates were too high. She helped us find the right solution. I would recommend her every time." "I'm a first time home buyer and Tamie was wonderful to work with. She was always available to answer questions I had throughout the process. She walked through all the details of my HUD Settlement letter with me to make sure I knew exactly what I was being charged. Her estimate was right on the mark with my settlement I had to pay at closing. I loved working with Tamie Platts and would highly recommend her to anyone. Thanks Tamie, you made my first home buying process very easy and un-stressful. Thanks again!" "This was our 2nd time working with Tamie and her team. We specifically requested working with her through our Realtor. Tamie made our 1st experience seamless and guided us through every step of the process. I always felt like they were working hard to make things work for us. This second home purchase seemed like a breeze working with the team again. They are extremely knowledgeable and ALWAYS helpful! We highly recommend Tamie to friends and anyone else needing her assistance!" "Tamie is very pleasant to work with and very knowledgeable. I really enjoyed working with her closing my house. She was very detailed and upfront running the loan numbers for me. I will recommend her to the fullest." "Tami was great through the whole process! We had a couple circumstances that she helped us with and worked her magic. She is very knowledgeable and takes time to explain things. I would highly recommend Tami for your lending needs! She definitely goes above and beyond, I will miss talking to her!LeAnne Stone"
"Tamie is Great, she's helped us out on 2 home purchases we've done. Tamie made the process very seamless and fast on our end. She's very detailed in her work and quick to respond with any concerns we've had." "Tamie and her team were very impressive and professional through the entire mortgage process. They communicated clearly and were very flexible with our schedule and needs. I highly recommend Tamie and Success mortgage to anyone trying to purchase a home!" "Tamie is very good at what she does. She guided me through the process well and answered all of my questions quickly and thoroughly. In addition, she is a caring individual and a good person to work with." "Tamie and her staff did everything within their power to provide me with a professional and exceptional service. From helping you complete the loan application, to weekly communication on my loan status, to the closing table, always with a smile. The loan process is often a painful and exhausting experience for home buyers. I should know..... I am a real estate agent. So it only made sense that I would choose the lender, I entrusted my clients with, with my own personal home mortgage. Thanks Tamie & the staff at Success Mortgage Partners, for a smooth transaction." "Tammie, and her team were such a great group to work with. They made this the best process my wife and I have ever experienced. I would recommend them to anyone looking for a lender. Our home buying process started the middle of January, we closed in February." "Tamie and her team were wonderful to work with during our loan process. The entire team worked hard and made our experience enjoyable. They have quick follow-up during each phase of your loan and willing to answer any question you may have." "My husband and I had a very pleasant experience with Tamie and her team throughout the home buying process! They were very kind and took the time to answer any questions and were quick to request and process paperwork leading to an early closing for us! We are still amazed at how swift the process was and have recommended her to friends. We will definitely use her in any future homes we buy. Thank you, Tamie and team!" "Tamie has been my preferred lender for several years. She has helped many of my clients, first-time buyers and more seasoned buyers. She is very knowledgeable and very pleasant to work with. My buyers love her and appreciate how hard she has worked for them." "Tamie and her team have worked with many of my buyers and successfully closed on time every time. Their service is exceptional, keeping all parties informed of the process every step of the way. Tamie and her team go above and beyond to help facilitate a smooth transaction. They help me and my business by helping my clients." "Tamie and her team are fabulous! I refer my clients to Tamie because she takes time to understand my clients' needs. She's reliable and most importantly, she's honest. She doesn't oversell and truly does a thorough job to find the best fit mortgage given each person's situation." "Tamie and her team were great to work with for my first time home buyers. Before we looked for homes the team spent time with the buyers explaining everything they needed to know about financing, closing costs and down payments. Once we were under contract we received timely and frequent updates on the status of the loan Highly recommend Tamie and her team!" "Tammie and her team walked us through the process of home purchase from day one to the end. They were very helpful in keeping us on course and found us the best rate. Definitely suggest that anyone looking for a mortgage company to give her a call." "Tammie, Abbey, and their team are very helpful and hard working. Especially Tammie and Abbey, they spent much time helping me find the right solution so I could qualify for the loan. Moreover, Abbey have spent her time to find a lower interest rate which I already hot. Both Tammie and Abbey are very nice and kind to work with. I wiuld give them two thumbs up and two toes up lol. Tammie's team! You guys rock!" "Tamie and her team was very insightful. They walked me through my home buying process explaining everything as we went. They always answer questions and returned email in a timely manner. I would definitely use them again and recommend them to others!" "I can't say enough about Tamie and Abbey. They both made our home purchase easy, stress free and enjoyable. Both are so knowledgeable, professional and always available. We have purchased other homes before but this was by far the easiest. I highly recommend this team you will not be disappointed." The team was wonderful and worked with me and all the traveling I do! We had a very good experience with Tamie Platts and are very happy to recommend to family and friends! "Tamie and her team are approachable, professional, warm, and knowledgeable. They take care of every client from first contact through closing, communicating with everyone throughout the process, and they always meet their deadlines! It is truly a pleasure working with Tamie, and everyone in her office!" "Tamie and her team have always been a knowledgeable and reliable resource for us over the years." "Tamie and her team walked us through the process with efficiency and competence. We were notified at every step of our status and the next step. The professionalism among all the team members was excellent. Anytime we needed to call, our call was received with a warm and inviting response. Both my wife and I received calls with frequent updates and check-ins to see if we had any questions about the process. I would highly recommend them to others." "I am extremely satisfied with the hard work and determination that Tamie and her team provided me during the approval and closing process on my home. She was certainly a joy to work with and would even consider her family now. Thanks again Tamie!" "Tamie and her team were extremely professional and helpful throughout the process. We were first time home buyers and so there were many things that I had no clue about. The team was helpful and walked us through the process. They are enthusiastic and really hard working. Would definitely recommend." "She kept me posted at all times on the loan progress, and gave me tips on the do's and dont's to keep me in good standing for my loan. We also closed on time." "I worked with Tamie Platts and her team at Success Mortgage Inc. to obtain a mortgage for my new home. Tamie and her team are the epitome of professionalism. They kept me informed step by step all the way through the process. This is the third home I have purchased and never before has the loan process gone as smoothly as it did with Tamie and her team. I would highly recommend Success Mortgage Inc. and Tamie Platts to anyone who is looking for a mortgage loan. Thanks Tamie for making this process and easy and enjoyable one." "I have attempted to start the home buying process but was never comfortable with the numbers. Working with Abbie was amazing! The team never left me wondering and kept my anxiety low. Thank you for holding my hand and helping me buy my 1st home." "Tamie and her team were wonderful to work with during our loan process. The entire team worked hard and made our out-of-state experience and closing on time. They have quick follow-up during each phase of your loan and willing to answer any question you may have. We would highly recommend them!" "Tammie's team was very enthusiastic and hwlpful with my loan. They had done a wonderful job trying to find the best way for me to get approved. They even spent time to find a lower interest rate than which I was approved at the beginning. I would highly recommend their business." "My experience was excellent and right on point with timing." "Tamie, Abbey and the whole Tamie Plats Team are just the best!!! Communication is key --- and they rock!!!! And when we've been let down by other lenders - talk about "pulling rabbits out of hats" --- well they've done that too!!!" Tamie was wonderful to work with!